When thinking of taking your first trip to Morocco, Marrakech usually springs to mind. 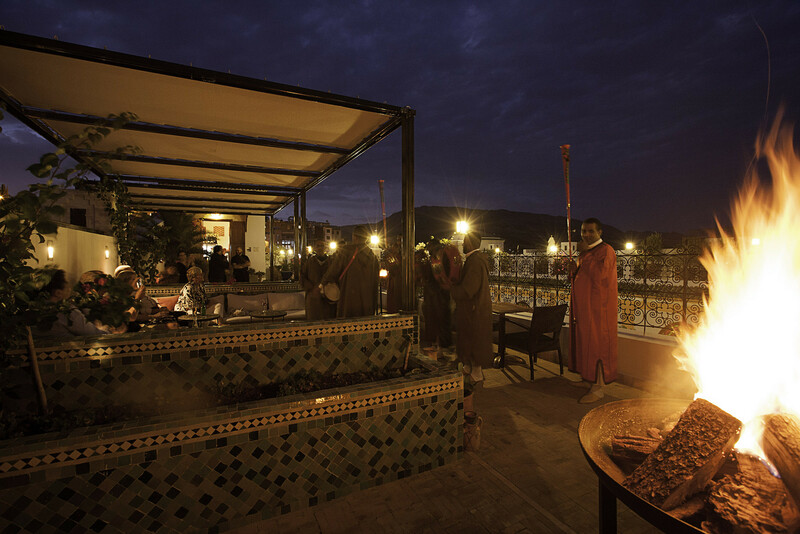 The ancient city of Fez is often overlooked, yet those who visit are pleasantly surprised. 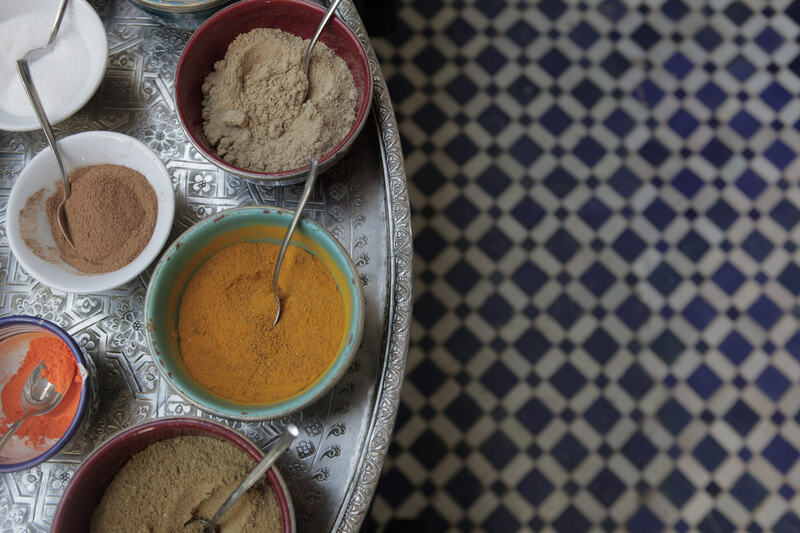 Fes is often referred to as Morocco’s cultural capital and for good reason. It’s like a living, breathing time capsule that would delight adventurers as well as those looking for a quiet retreat. If you want to get a feel for authentic Moroccan high living, you would do well to stay in one of the riads. Note: A riad is a traditional Moroccan house with a central garden or courtyard that is a must go when travelling to this beautiful country. Behind one of the unassuming doors on the streets of the medina, you will discover the glorious Palais Amani hotel. 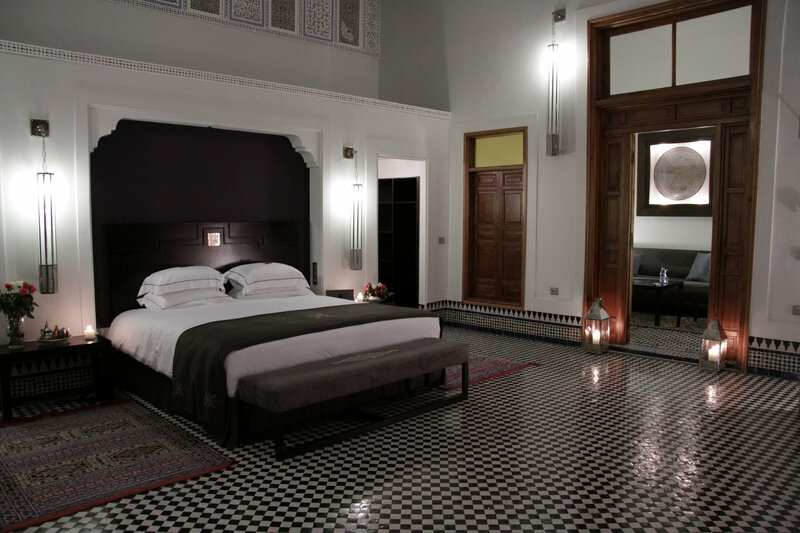 This luxurious eighteen bedroom riad has traditionally-designed,spacious rooms and refined dining. 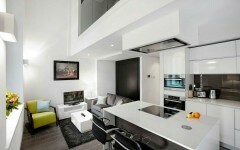 There is a large communal living space that comes with a bar and fireplace where you can relax and enjoy a cocktail or cheeky whisky. The staff are very friendly and really make you feel at home. On arrival we were greeted and presented with tea and delightful soft cookies that contained coconut and dusted with powdered sugar. We were taken to our room, which had splendid wooden doors to block out any daylight from the secondary glass doors. The room itself was a good size with a well presented bedroom and bathroom. There was even a welcome note left for us, which is always a nice touch. Looking around, facilities include a rooftop bar and beautiful terraces where you can have a snack whilst taking in the sounds of the azaan – an Islamic prayer practised five times per day. It is a spiritual experience, especially when you can hear the sounds reverberate through the old town. There is a picturesque courtyard that houses lemon and orange trees, bringing exotic wildlife, including birds that you can hear singing as you enjoy your breakfast or lunch. 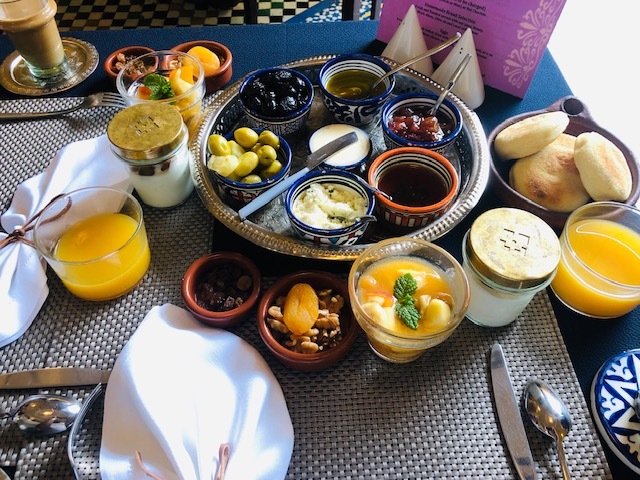 The next day, breakfast included an assortment of foods to choose from such as omelette, natural yogurt, bread, olives, fruit – a great selection. You could also choose fruit juice, coffee or tea for drinks. One of the dishes on hand for lunch was a traditional lamb and vegetable dish that was both filling and delightful. This is available on Fridays and we were glad we were there to savour it. 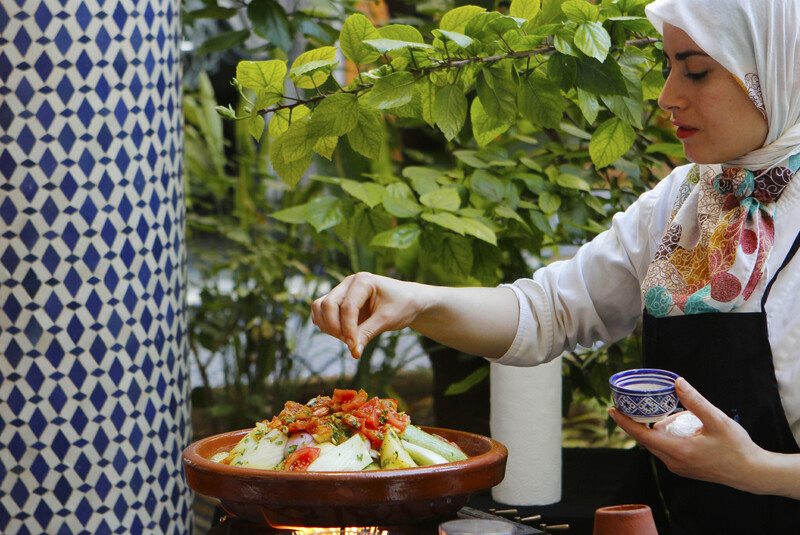 Activities at Palais Amani include cooking classes, where guests are taught mouth-watering Moroccan cuisines using ingredients sourced from the historic souk – which we visited on our special cooking tour. At the start of our tour we were greeted at the reception by a guide, as well as the chef. As the cooking class headed through the market, we were taken to a place where they sell fresh chicken, spices and veg. After we picked up all the bits we needed we were taken to our first pit stop for a traditional Moroccan soup to whet our appetites. We were then taken to a little café where they sell Etay, a traditional Moroccan hot tea infused with fresh mint and jasmine. 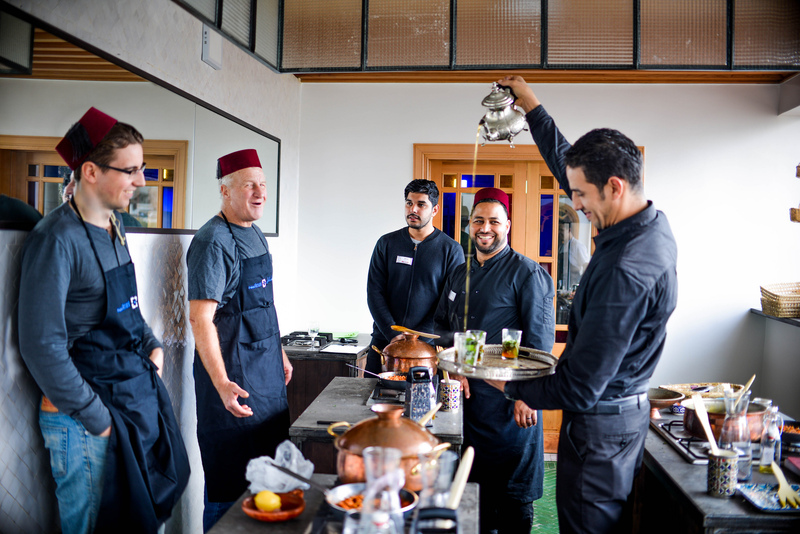 After a well earned break we headed back to Palais Amani to start our cooking class. Even washing our hands was an experience. Cool water was poured onto them by staff as we lathered with fragrant soap, before individual towels were provided to dry off. We then proceeded with the cooking. On the menu was lemon chicken tagine for the main and sour baked apple for dessert. We were all placed at our stations and given an apron and a traditional Moroccan hat which you could purchase after the class as a keepsake. After cutting, chopping, dicing and peeling an assortment of vegetables, and of course the apples, we finished preparing our dishes and were asked to go and relax until the dinner had finished cooking – roughly an hour. After a mouth-watering wait we went to th restaurant to be presented with our meal. We were impressed at how these quick and easy-to-make dishes were packed full of flavour. 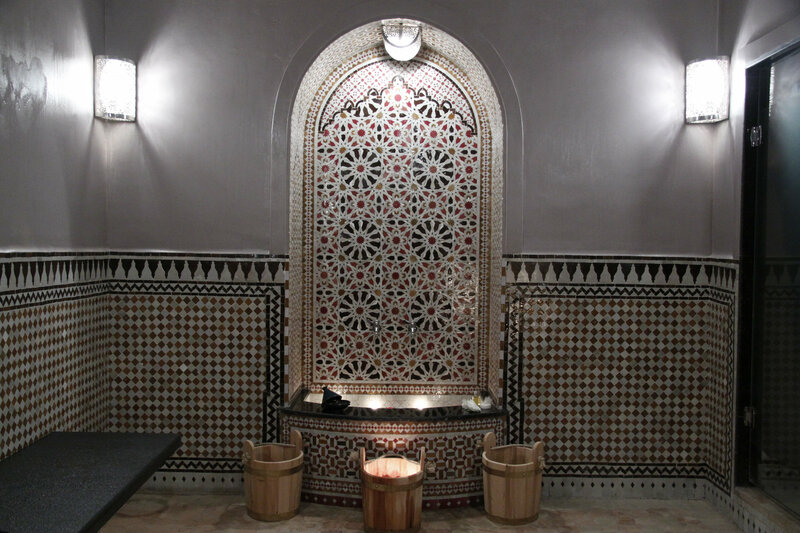 One of the other facilities in this enchanting riad is of course, a hammam spa. 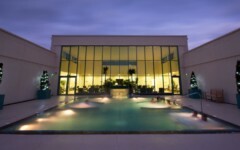 From the moment you enter this pampering haven, you are welcomed by a member of staff who will prepare you for the spa experience. This entailed a soak and full body scrub using Moroccan salts. You are then treated to a facial and body massage with Sabon Beldi (a method using black soap to extract the toxins from your skin). We found this to be a truly invigorating experience worthy of revisiting. 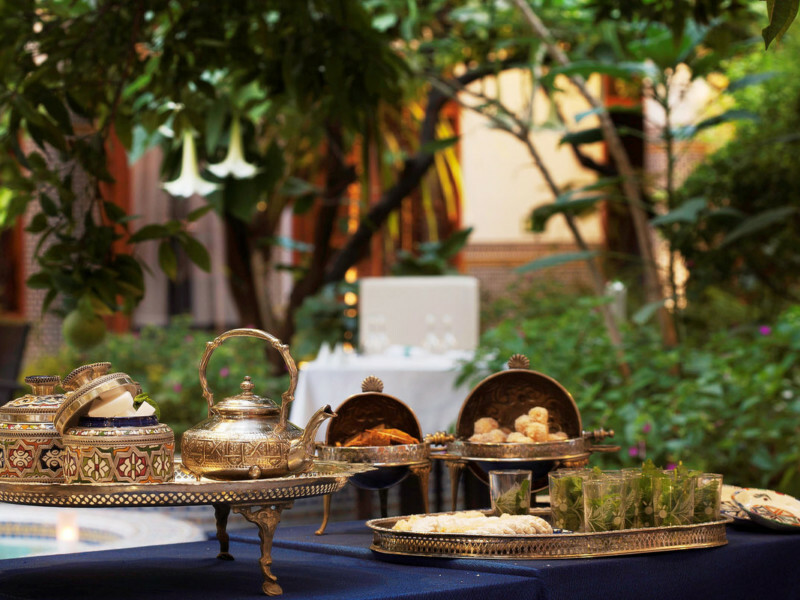 Palais Amani is pleasingly close to the buzz of the souk and all of its temptations. The pedlars of fine copperware, jewellery, rugs, keepsakes, and clothing are all within the vicinity. From this stylish home away from home, you can even go on a tour taking you high into the mountains for a picnic that overlooks the old city. 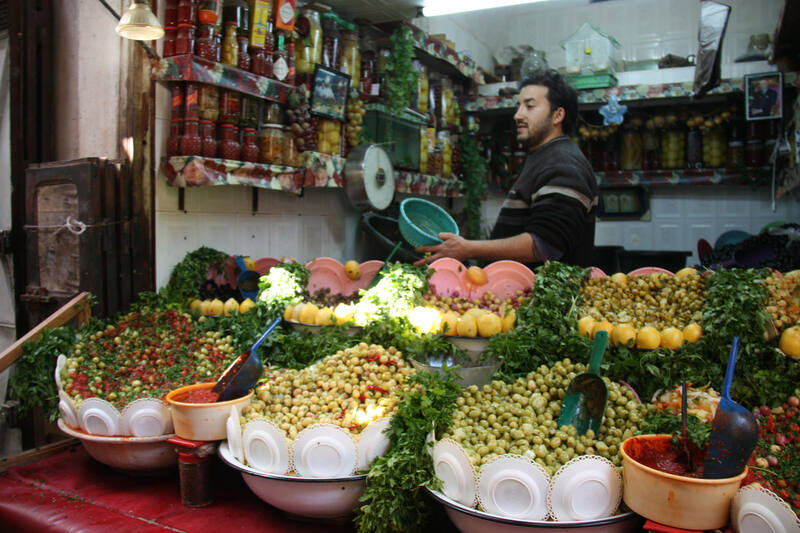 If you like shopping, another tour will take you deep within the medina to explore the best products that Fes has to offer. Be prepared to be as amazed as we were when small walkways lead to vast open caverns of impressive wares. 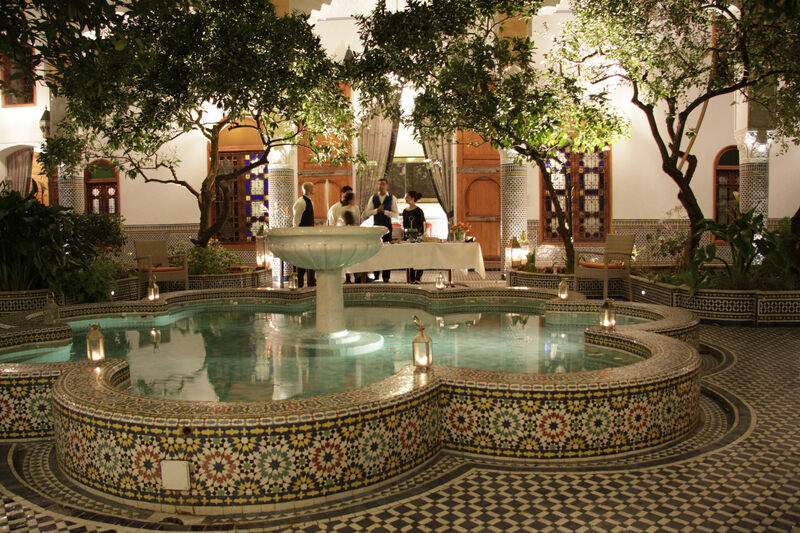 If you want a real experience of the old Morocco, staying at Palais Amani in Fes does not disappoint. 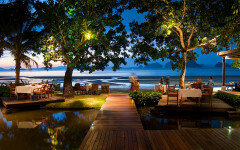 Here, you can choose to let go of the hubbub of the outside world on the scenic rooftop bar or take in the traditional sights, styles, foods, and way of living of this eclectic land. You’ll be booking that flight back the moment you get home.